In at least one way, the esteemed executives who lead the world’s most powerful companies are just like you and me: They get bored at meetings. Particularly at corporate board meetings jammed with mind-numbing show-and-tell from management, stale formalities and the same few aggressive bloviators drowning out effective debate. Yet these meetings, where chief executives update the board of directors (aka their bosses) on a company’s status and plan for the future, are critical to running a successful company. When a board isn’t paying attention, the consequences can be devastating -- for the company and even for the economy. Some boards are doing it better, in part because they must. For many decades, most boards were sleepy backwaters stuffed with company insiders who did little more than rubber-stamp the CEO’s agenda. Then at the turn of this century, a series of accounting scandals led to devastating bankruptcies at WorldCom and Enron, which led to stricter laws regulating the boardroom. Boards are now required to have directors who are independent -- not employed in another capacity by the company. And directors who sit on public company boards face real financial -- even criminal -- consequences if they screw up. But the most successful boards do more than simply avoid accounting scandals. They shape strategy, identify new areas of business and vet deals. They speak up when a company ventures into overly risky territory. They help CEOs decide on staffing, ensuring the right talent is in the right position. And, perhaps most crucially: They hire and fire CEOs. Often it takes a CEO change, and a bit of a business crisis, to push a board to make itself better. Johnson & Johnson was at a crisis point in 2012 when the company brought in a new CEO -- longtime insider Alex Gorsky -- and decided to reinvigorate its board meetings. One of J&J’s most trusted products, children’s Tylenol, had been pulled from the shelves in 2010 and 2011 in several major recalls due to quality issues. The company also had to recall adult Tylenol and Benadryl, among other products, in those same years. 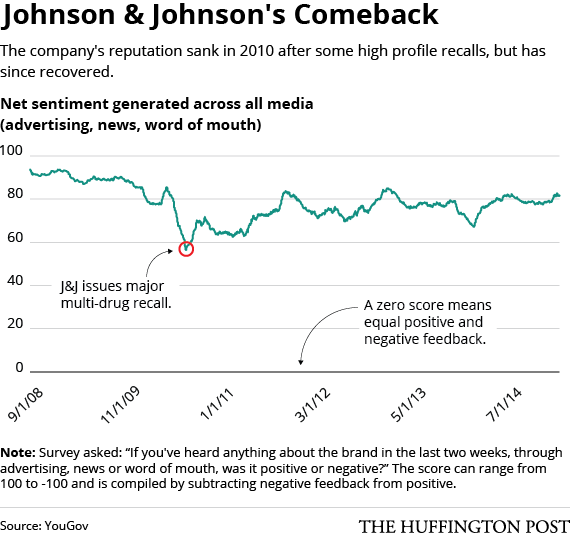 As a result, J&J's reputation took a hit. The company's Buzz score, a measure of sentiment toward the brand generated by market research firm YouGov, dropped from a very positive 90 percent in 2009 to 59 percent in 2010, during the height of the recalls. It had rebounded to around 75 percent by the time Gorsky took over in 2012. The directors changed things up, with a goal to create more efficient, effective meetings. They created dashboards of important metrics for the board to review before meetings -- the business-as-usual topics that typically overwhelm board discussions. Now directors are expected to extensively prepare before they meet. “We freed up the agenda to spend time on the meaty business topics,” says Mulcahy, noting that she wishes she had implemented some of J&J’s board strategies when she was leading Xerox through its turnaround as CEO back in the 2000s. The J&J board also asked directors to refrain from checking email during meetings, a notorious productivity killer. Directors do have mobile devices -- the board reviews documents on iPads, instead of the typical binders used in these meetings. And in a revolutionary move for a Fortune 100 company, the board limited the number of PowerPoint slides you can show to just five. “We made a real effort to improve the level of dialogue and decision-making,” CEO and Board Chairman Gorsky told The Huffington Post in an email. J&J stock now hovers at around $100, up from around $70 before Gorsky joined. Its Buzz score is at 81 percent. J&J’s first step to reforming its board was a self-assessment -- a clear-eyed look at its strengths and weaknesses. More boards are taking this critical step. In 2000, only one in four companies evaluated their board’s performance, according to data cited in the book Boards that Lead by Ram Charan, Dennis Carey and Michael Useem. Now, 98 percent of boards say they conduct some kind of annual board evaluation, according to a study released in November 2014 from executive search firm Spencer Stuart. “Boards are stepping up,” says Carey, who is a vice chairman at Korn/Ferry International, another executive search firm. Driving the change, he says, are independent board leaders like Mulcahy. In the wake of regulations after Enron and WorldCom, public companies are now required to have independent lead directors. The best of these leaders help the board come together as a team and truly “coalesce,” Carey says. In many cases, these leaders set the agenda around strategy. The best boards are also thinking about the questions CEOs don’t have time for -- or don’t want to think about: Are we ready for a possible cyberattack? What happens if that CEO gets hit by a bus? Selecting the right chief executive and grooming CEO replacements -- wonkily dubbed “succession planning” -- is one of a board’s most critical tasks. A surprising number of boards mess it up. Thanks to a board fraught with infighting and turmoil, four different CEOs ran Hewlett-Packard between 2005 and 2010. Some directors refused to even meet with potential candidates to succeed one of the ousted chiefs: Mark Hurd. “It has got to be the worst board in the history of business,” a former HP director told New York Times columnist James B. Stewart. “While composed of many accomplished individuals, as a group [the HP board] was rife with animosities, suspicion, distrust, personal ambitions and jockeying for power that rendered it nearly dysfunctional,” writes Stewart. Though conflict helped sour the HP board, a healthy dose of disagreement is a crucial factor in having good board meetings. Experts, CEOs and directors all note that the best board meetings feature a give-and-take between the chief executive and directors. Smart CEOs push their directors to speak up. When he was chief executive of Medtronic, Bill George noticed one director was largely silent at meetings. He took him aside privately and urged him to speak out more. It turned out the director, who was a doctor, felt he didn’t have the finance acumen to speak on business topics with so many business experts on the board. George now recalls that he told the doctor he had “wisdom and experience to offer." After that, the director became much more vocal, and had a powerful influence on other members of the board. “You want all voices on the board to be heard; anyone who’s not speaking, you have to ask them to speak,” George says. Medtronic is a medical device company, and it needed the doctor's medical expertise. Good boards must be staffed with directors who understand the business -- a lesson learned bitterly in the wake of the financial crisis of 2008. After Lehman Brothers collapsed, taking down the U.S. economy with it, many wondered why the investment bank’s board wasn’t on top of its ballooning risk. It quickly came to light that the board didn’t have expertise in the financial instruments -- credit default swaps -- that tanked the firm. Indeed, notable nonexperts on the Lehman board included a theater producer and even an octogenarian actress. To be sure, it’s not clear exactly how many boards have embraced openness in the way that J&J and others have. And the boardroom has a long way to go: Corporate boards still suffer from a lack of gender and racial diversity. Women make up just 19 percent of all directors at S&P 500 firms, according to Spencer Stuart. Fifteen percent of the directors at the largest 200 S&P firms are minorities, according to that same study. Yet a raft of research has shown that a diverse board improves a company’s performance. And those regulations that spurred change? They are also frequently blamed for holding boards back, drowning directors in a sea of financial materials that leave little room for strategy talk. Some of the best boards, like J&J, have figured out how to balance the conflicting needs. But as Carey and others note, there's lots more work to be done.